Its model number and name are #208 / Alan Scott. Its model number and name are #077 / Sentinel. Its model number and name are #076, 078 / Green Lantern. Character Bio - Thousands of years ago, a mystical flame fell to Earth in the guise of a meteor. It is said that destiny controlled the hands that fashioned the flame into first a lamp, then later a lantern. It was in this latter form that the flame fell into the hands of young Alan Scott, a railroad engineer. In the wake of a railroad accident, the flame instructed Alan Scott how to shape a piece of itself into a ring. This ring granted Alan many magical abilities, though with a weakness to wood and other living plant matter. Alan used these abilities to become a costumed crime fighter, calling himself Green Lantern. 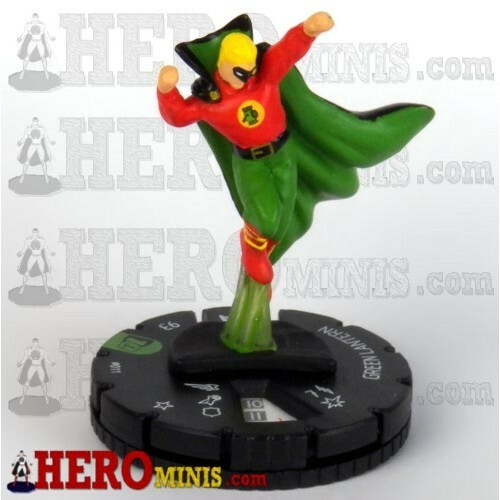 After many of his own adventures, Alan Scott would go on to become a founding member of the Justice Society of America, later training generation after generation of new heroes. To the end, a hero, a shining light in the darkness. As a Green Lantern, Green Lantern has these Green Lantern Synergies. As a Human, Green Lantern has these Human Synergies. As a Mystery Man, Green Lantern has these Mystery Man Synergies. As a figure with the Flying special power, Green Lantern cannot be affected by aspects of certain special powers. Current Special Powers that Interact Differently with the Flying special power. As a figure with the Super Strength special power, Green Lantern cannot be affected by aspects of certain special powers. Current Special Powers that Interact Differently with the Super Strength special power. As a figure with the Valiant personality, Green Lantern cannot be affected by aspects of certain special powers. Current Special Powers that Interact Differently with the Valiant personality. As a Human, Green Lantern interacts differently with certain special powers. Current Special Powers that Interact Differently with Humans. As a figure with the Super Strength special power, Green Lantern interacts differently with certain special powers. Current Special Powers that Interact Differently with the Super Strength special power. As a figure with the Flying special power, Green Lantern can be affected by aspects of certain special powers. Current Special Powers that Interact Differently with the Flying special power. As a figure with the Valiant personality, Green Lantern can be affected by aspects of certain special powers. Current Special Powers that Interact Differently with the Valiant personality. Recharge power changed to recharge all. Last edited by Ronin; October 31st, 2017 at 09:27 PM. Start the game with a green Boxing Glove Marker, a green Shield Marker, and a green Cage Marker on this card. Before attacking with this Green Lantern, you may remove a Boxing Glove Marker from this card and roll 2 additional attack dice. Before defending with this Green Lantern, you may remove a Shield Marker from this card and roll 2 additional defense dice. Once per round, before a figure within 4 clear sight spaces begins its movement, you may remove a Cage Marker from this card and prevent that figure from moving this turn. After taking a turn with this Green Lantern, if he did not move or attack, you may place all previously removed markers from the Green Power Ring special power back on this card. When this Green Lantern is adjacent to at least one Evergreen Tree or Jungle Piece, he rolls 1 fewer attack and defense die. Last edited by IAmBatman; March 9th, 2016 at 11:09 AM. There are a couple of possible figures for this guy (I have two that could work myself), so any preferences on which we use? When Green Lantern is adjacent to at least one Evergreen Tree, Jungle Tree, Jungle Bush, or when he attacks or defends against an Archer or Amazon, he rolls 1 fewer attack and defense die. I may be wrong but doesn't he also have a weakness to Undead figured because of this? Looks good to me. But why Amazon? They use steel . Great "classic" approach to the Green Lantern powers... more limited in some ways, which fits the OG[L] himself. No strong preference for a figure, but DC 10TH would be my pick. The Origin one is also fine, though. Archer and Amazon seem like sort of a stretch for Wood Weakness... the Amazons fight just as often with iron and steel weaponry, and our modern Archers would probably be uses carbon-fiber/aluminum arrows. I think Plants and Plant Elementals would be more strongly realized if a bit more niche. I like the top two powers, but I agree with the others that I'm not quite feeling Wood Weakness. If anything, I'd rather just stick with the first sentence and drop the weaknesses to specific classes. That's less confusing too as then you don't have to ask if he rolls 2 less if an archer attacks him while Alan is adjacent to a tree. I believe he has struggled in combat with Simon Grundy, but that being due to Grundy's swampiness more than his undeadiness. That's probably the best approach. I toyed with the idea of dropping to that first sentence too, but thought I'd at least float this less niche version out. I'm cool with the simplified version, though, where his only real counter will be Floronic Man. Oh and the cool stuff in this design is pure Griffin. I just liked the ideas too much to see them go to waste. This is about 99% his design. I'm happy to see this one getting some light.